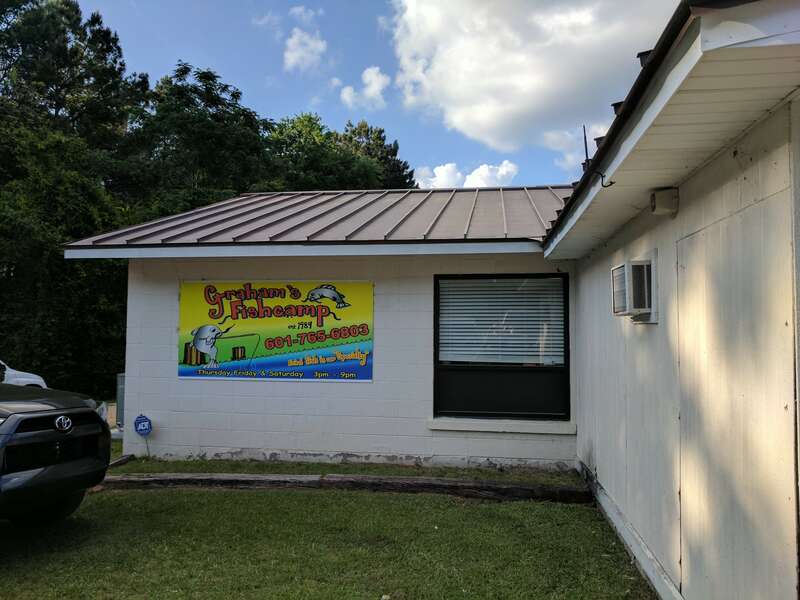 As you travel on US Highway 49 between Hattiesburg and Seminary, there is a farm stand/restaurant over three buildings and a fenced in outside area called Shady Acres Village. 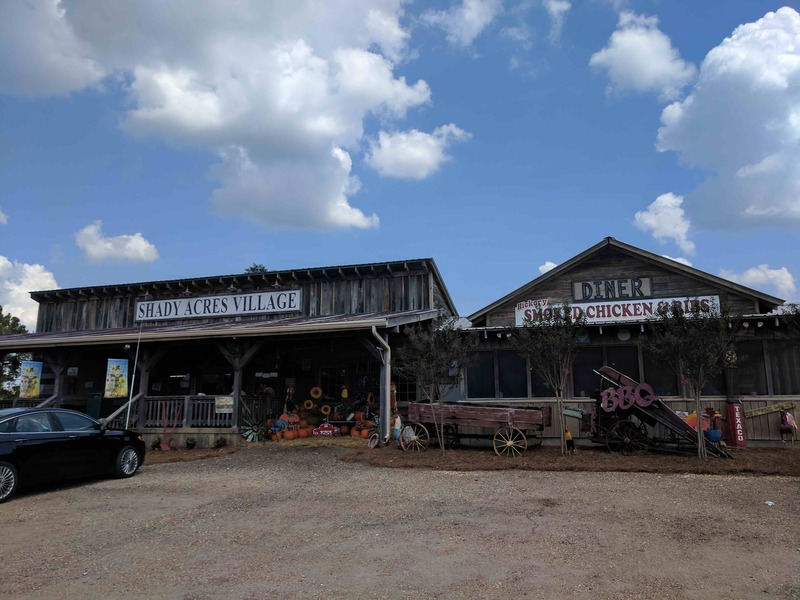 While the outside area has plants, metal chicken sculptures and other yard art, the inside is a tight packed general store with local seasonal produce, a bakery with pies and cakes and an entire wall of jams and jellies. Attached is also a restaurant with hot plates (ribs, chicken, fried fish, etc) and darn tasty hamburgers. 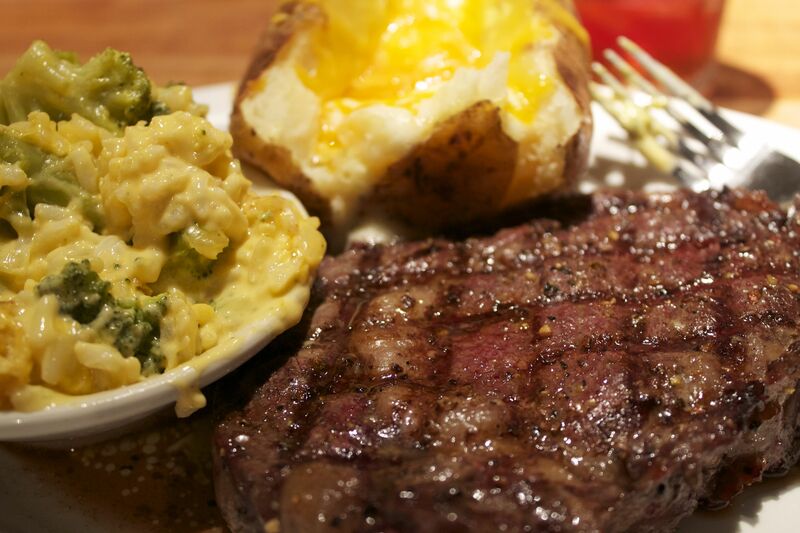 And, the other with fries and we share our sides. The drinks are refillable. There is plenty of seating including an outside seating area that is covered (and has fans), so we usually stop there when we are traveling with the dog, as she is welcome there. The staff are all super friendly and the bathrooms are clean. 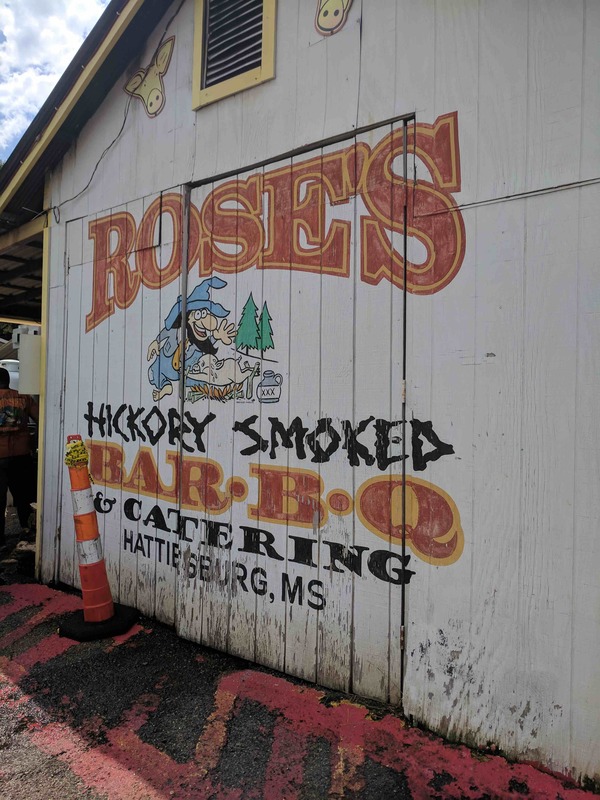 It is a great place to stop when you’re road tripping along US 49. 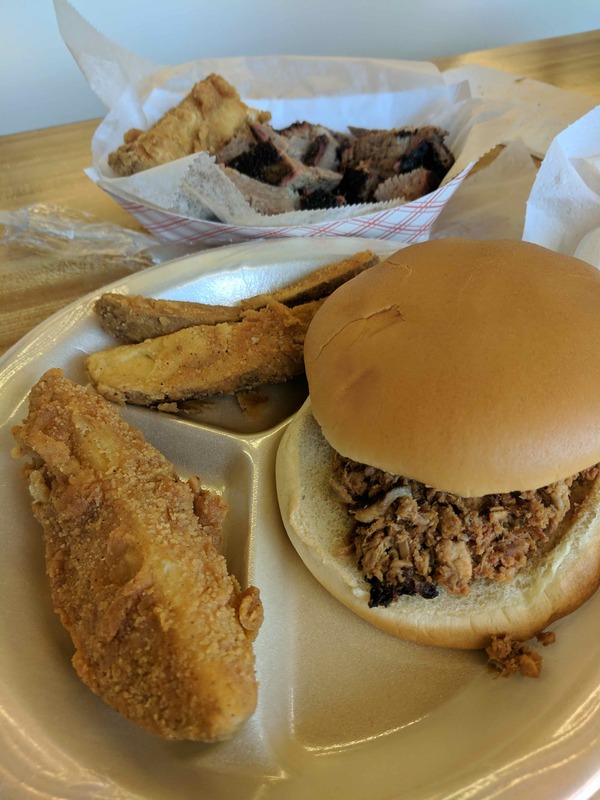 On Highway 588 in Collins, Mississippi there is a small restaurant that does a booming business on Thursday, Friday and Saturday nights. 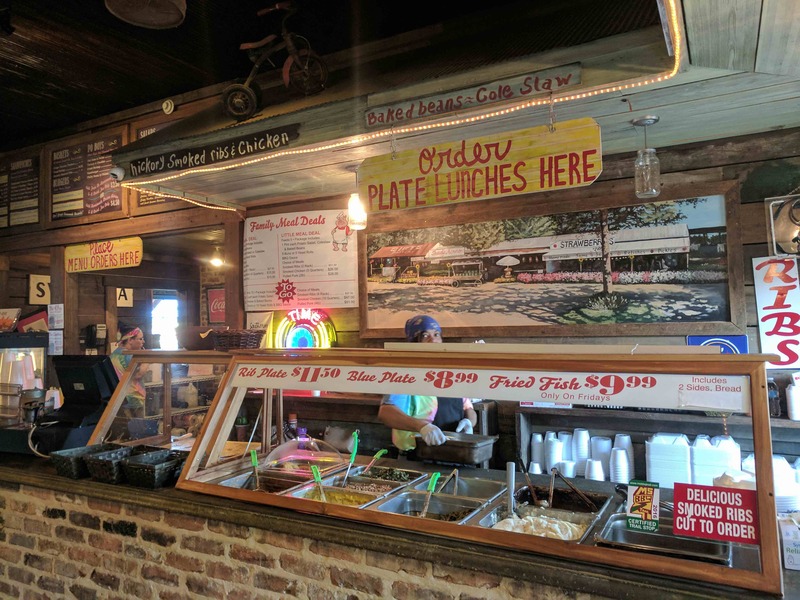 Only open from 3 to 9 on those nights, Graham’s Fish Camp is packed the entire time. 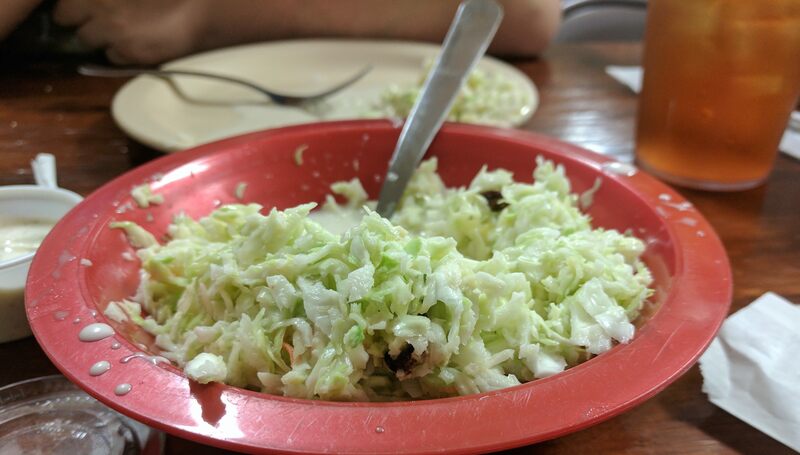 They start you out with a huge bowl of coleslaw while you look over the menu, although most folks seem to already know what they like. 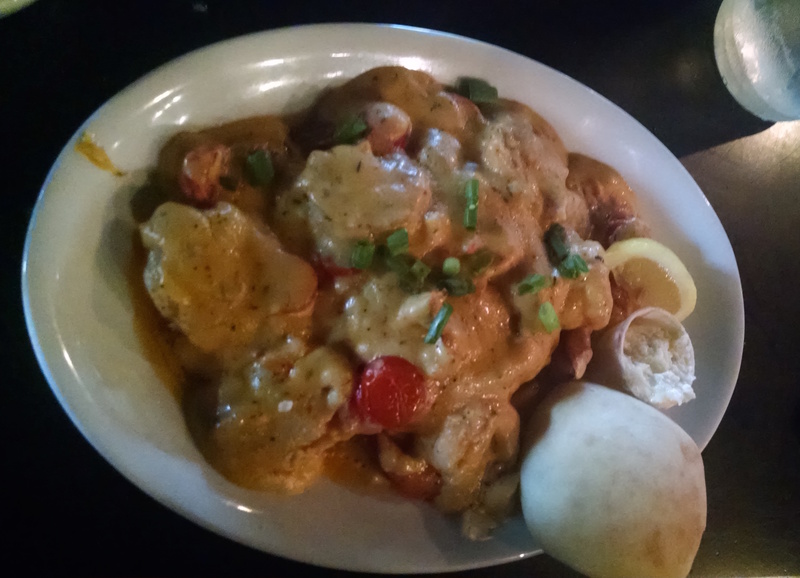 From looking at the other tables, catfish (Mississippi farm raised) was a heavy favorite. We started with fried dill pickles and onion rings. 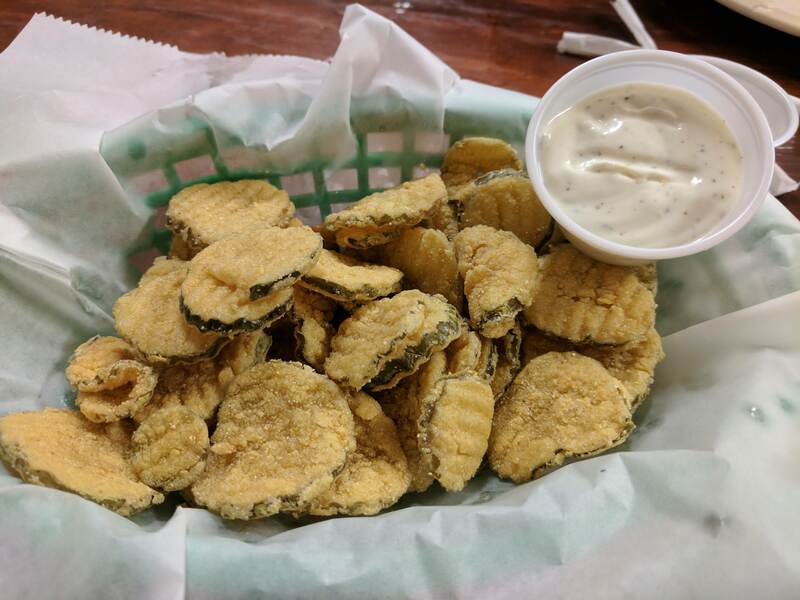 One of Elvis’ favorite snacks, the dill pickle chips are battered in cornmeal and quite crunchy and tart. 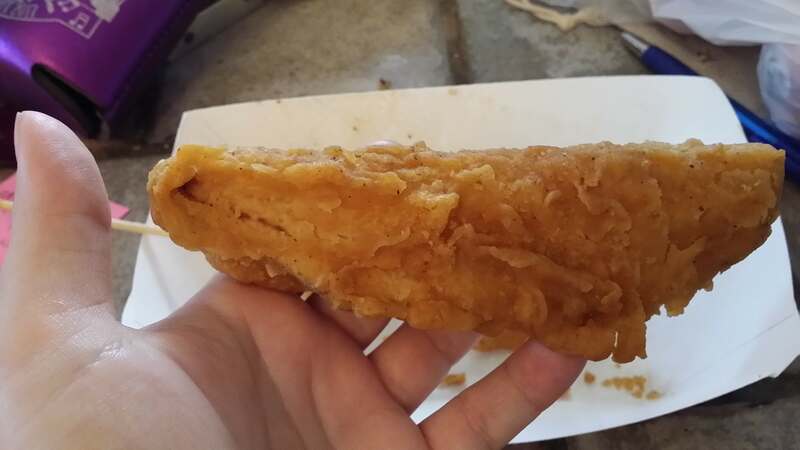 The onion rings were thick and hand battered. The baskets are huge, so I’d recommend the half portion sizes. 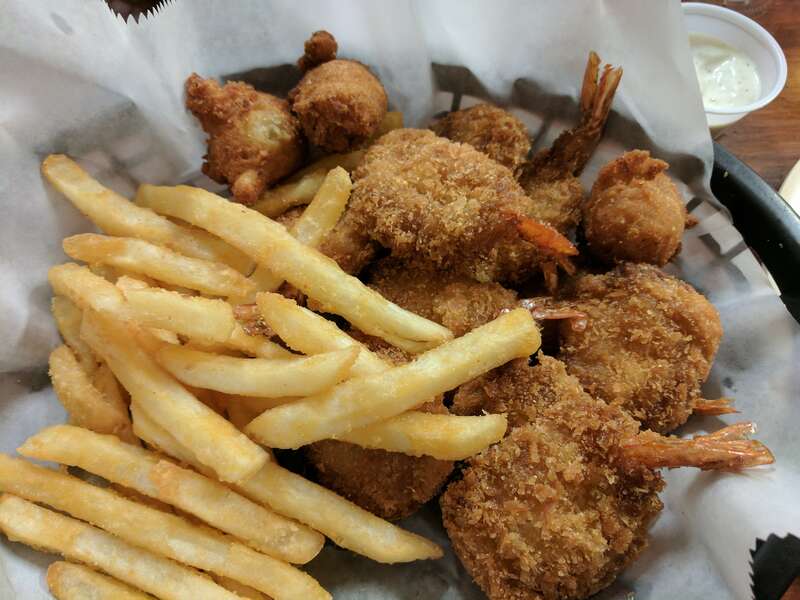 I had the fried shrimp platter – 12 shrimp, 3 hushpuppies and a mess of French fries. Crunchy batter on flavorful shrimp – quite tasty. 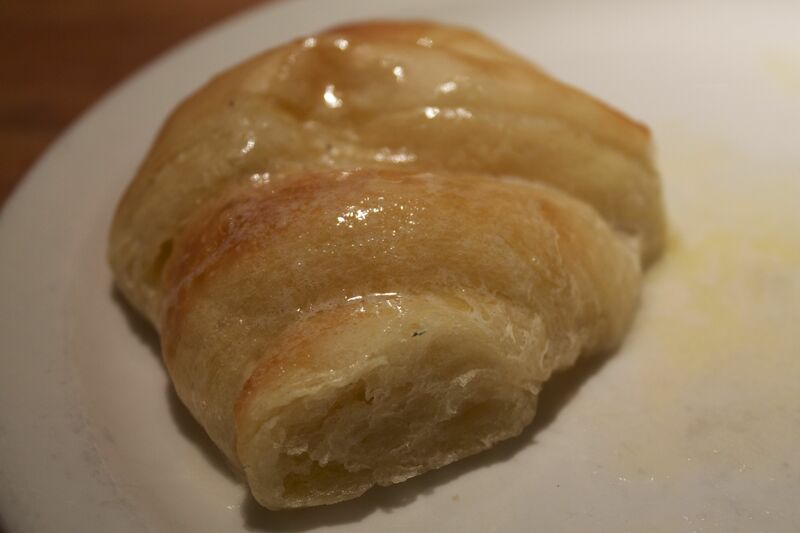 The house made tarter sauce was tart and creamy. 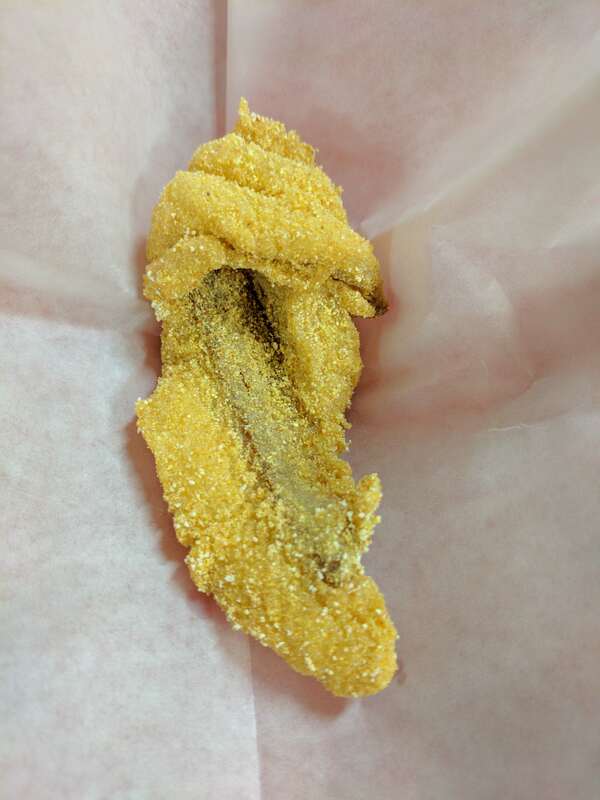 Michelle had chicken tenders plus a catfish filet. Thin sliced with a delicious cornmeal batter, it was fresh and clean tasting. I can tell why so many people come here. They end the meal with soft serve ice cream and your choice of toppings. 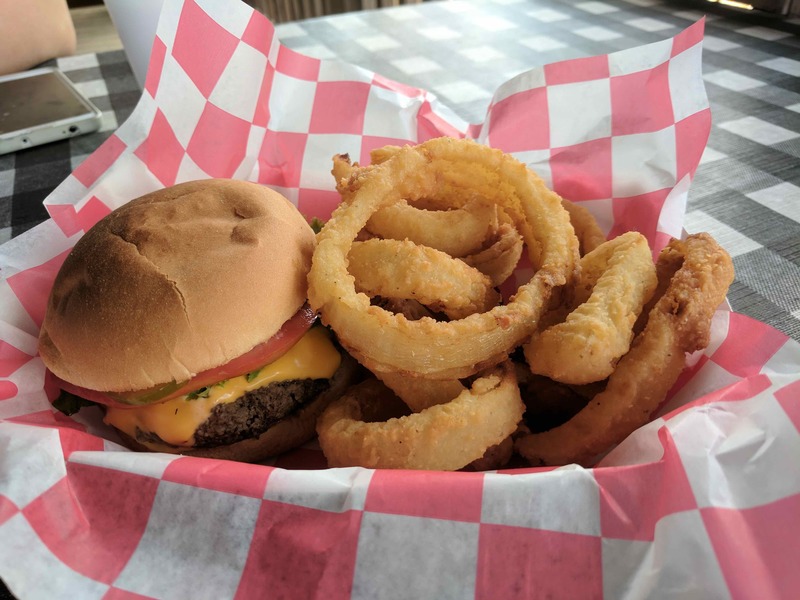 For as busy as they are, the wait staff is friendly and quick with refills on the drinks and to check to make sure you don’t need anything else. 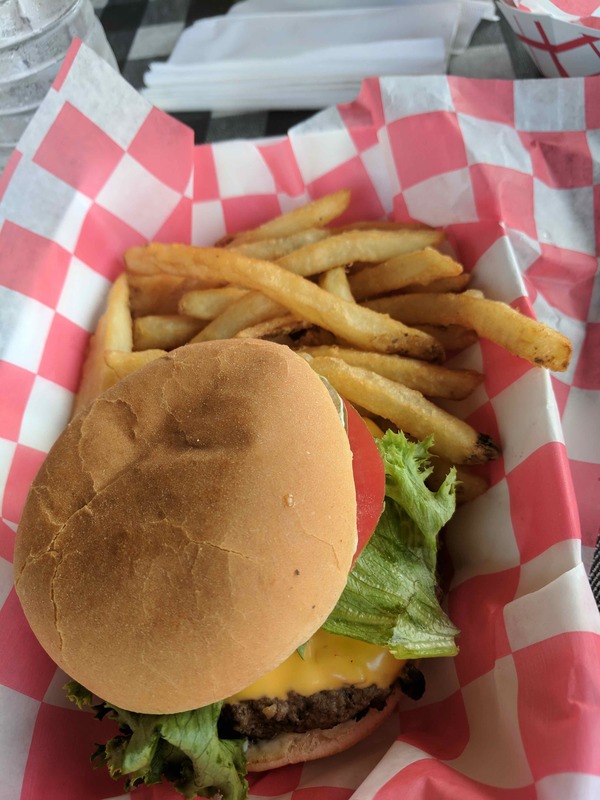 The cost is quite reasonable, too – for under $20 a piece, we had a huge amount of great food. Definitely worth a visit. I was up in Jackson, Mississippi for an Equality Summit with HRC Mississippi. The event was downtown near the old capitol, so afterwards we walked to the Iron Horse Grill for dinner. The salsa was very bright and fresh and the waiter confirmed that it is made in house each day. We enjoyed it with two baskets of their tortilla chips and a lovely margarita. 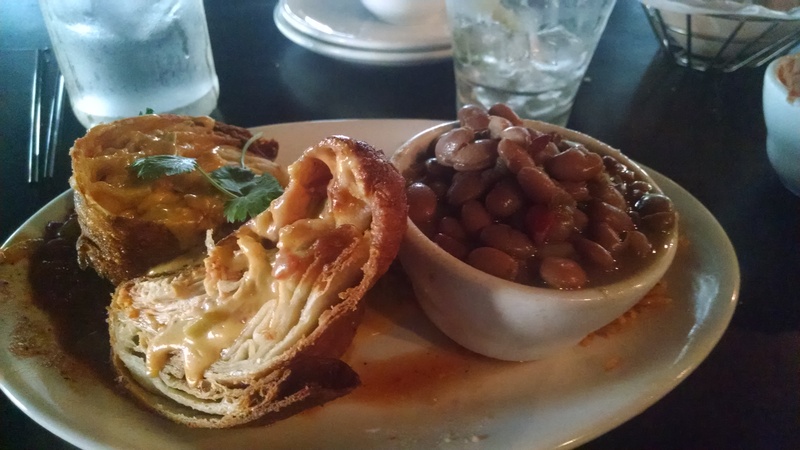 For the main course, I had one of the best chimichanga’s I’ve ever had. Shredded beef wrapped in a toritilla, deep fried and then topped with queso and ranchero sauce. 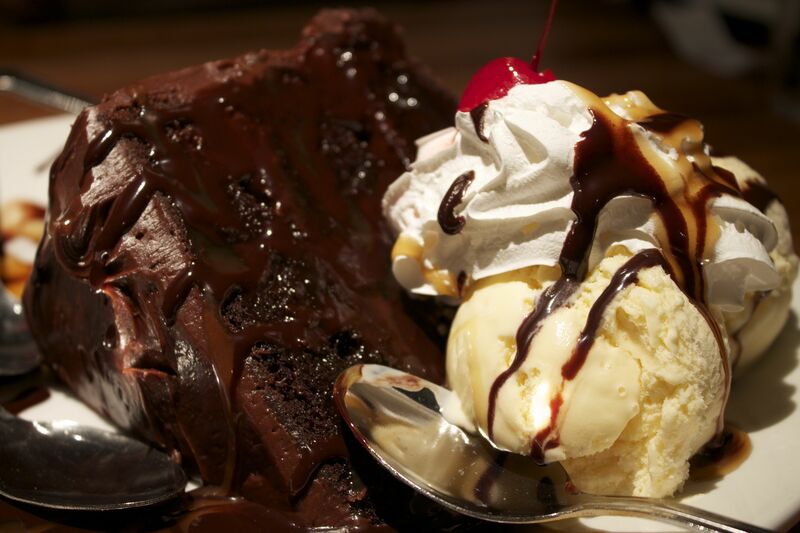 Layers of flavor, all of them good. Michelle had the shrimp and grits on the servers recommendation. 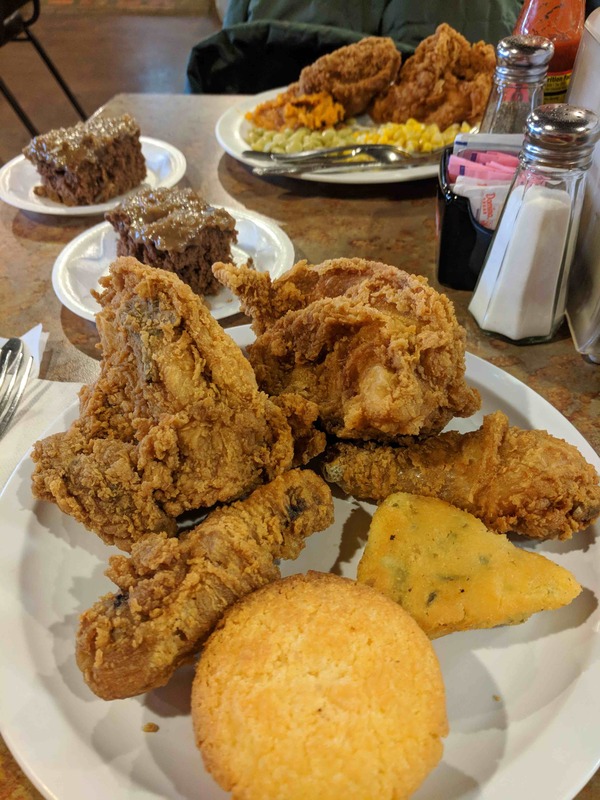 The grits were a local variety and ground extremely fine. 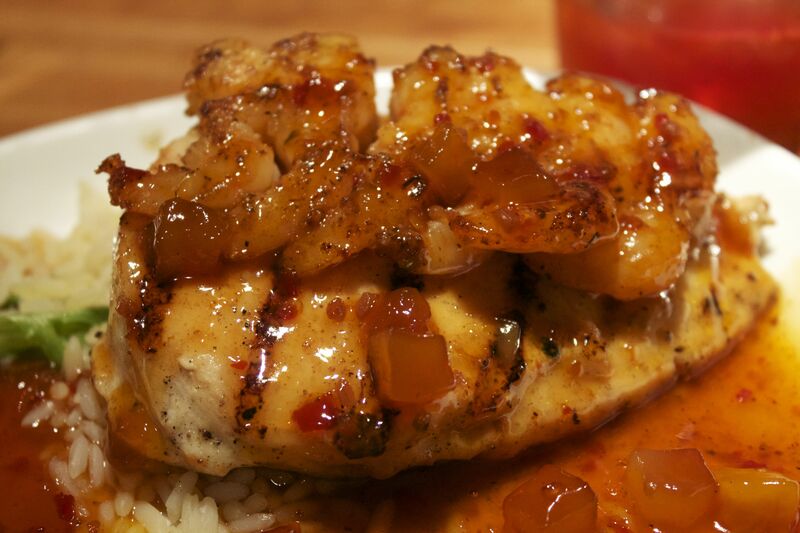 The sauce was quite yummy but, because they left the tails on the shrimp, it was a very messy meal to eat. I don’t think cooking with tails on adds that much flavor and taking them off would definitely improve the dining experience. The staff was knowledgable and attentive and quick with refills. Afterwards, we wandered through their Mississippi Music Experience. This onsite museum has wax statues, signed memorabilia and audio/visual displays of the state’s musical history and it’s iconic musicians. 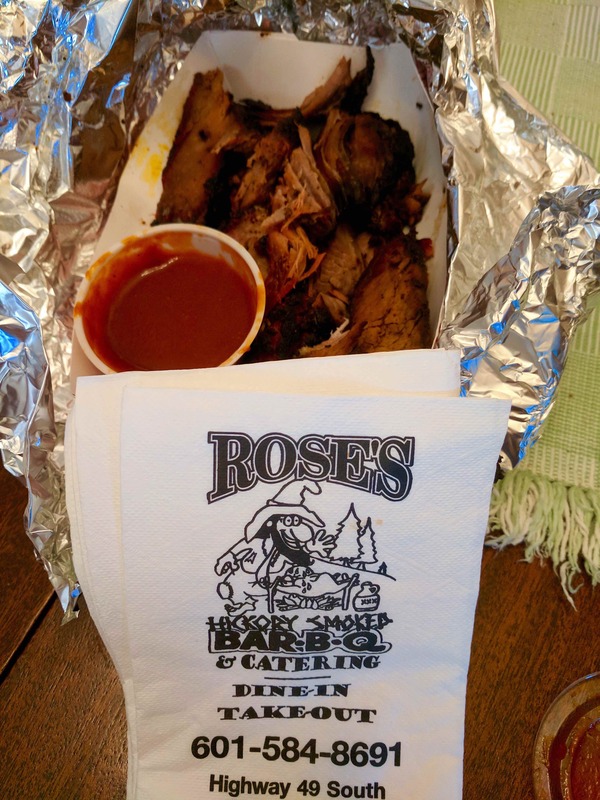 I’d definitely recommend the Iron Horse if you’re in the Jackson area. My phone went swimming during our kayak trip down the Okatoma on Saturday so we had to make an unplanned trip to Hattiesburg yesterday. After a suggestion from the woman at the Verizon store, we decided to go to Petra Cafe. 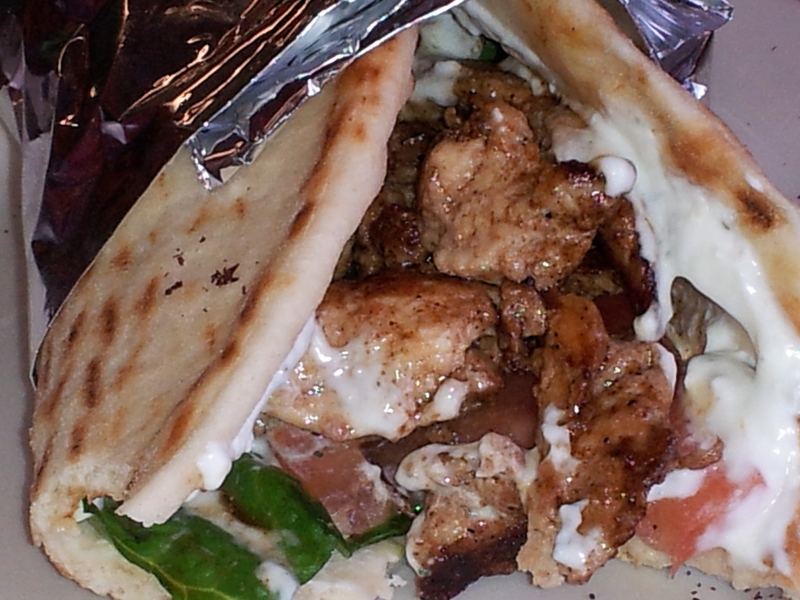 Located across from University Southern Mississippi, they serve Greek and Mediterranean cuisine in a casual atmosphere. 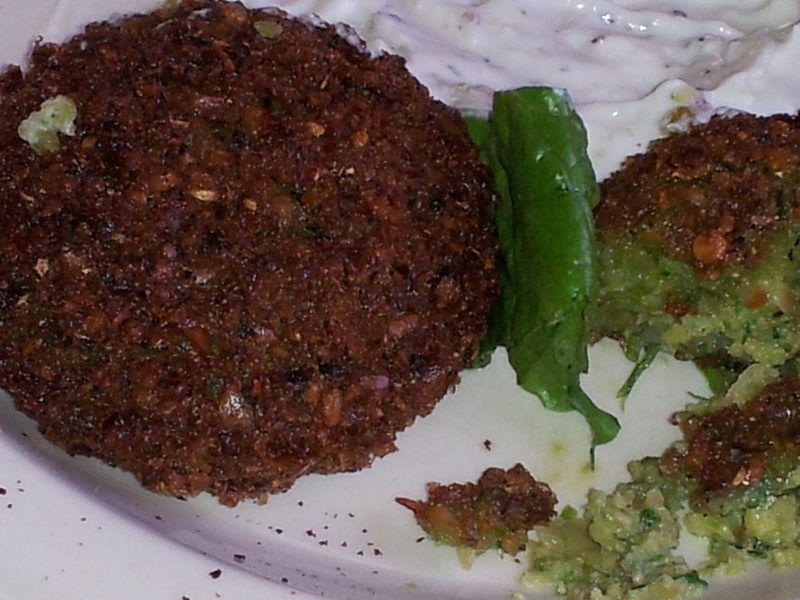 We started with the falafel patties with Grecian sauce. Fresh from the fryer, it had very fresh flavor with the chickpeas, onions and spices. The sauce was so good we asked for more. I had the chicken shawarma gyro. The marinated chicken was quite tasty and they had stuffed the fresh, warm pita full to overflowing with meat, onions, tomato, lettuce and yogurt sauce. 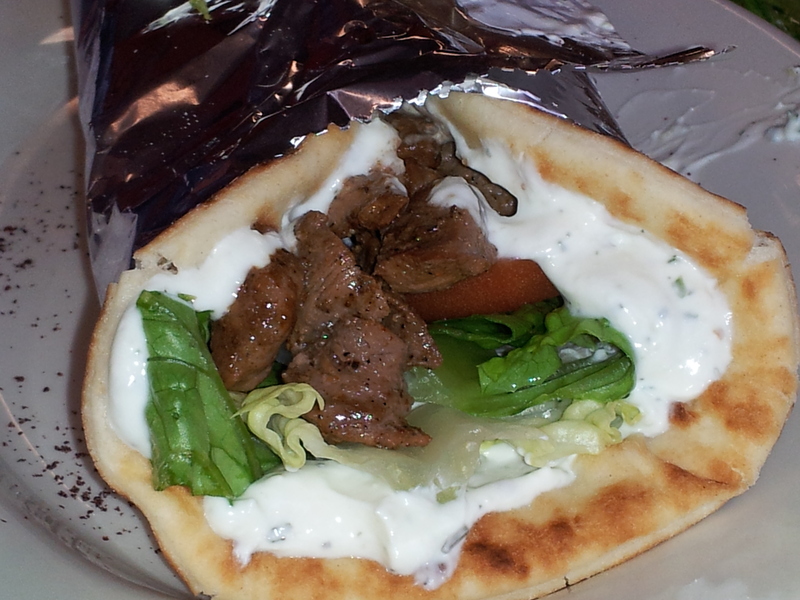 Michelle went with the lamb shawarma gyro and enjoyed the lamb slices. She also took all the lovely pictures as my replacement phone won’t arrive for another day and I forgot my camera. 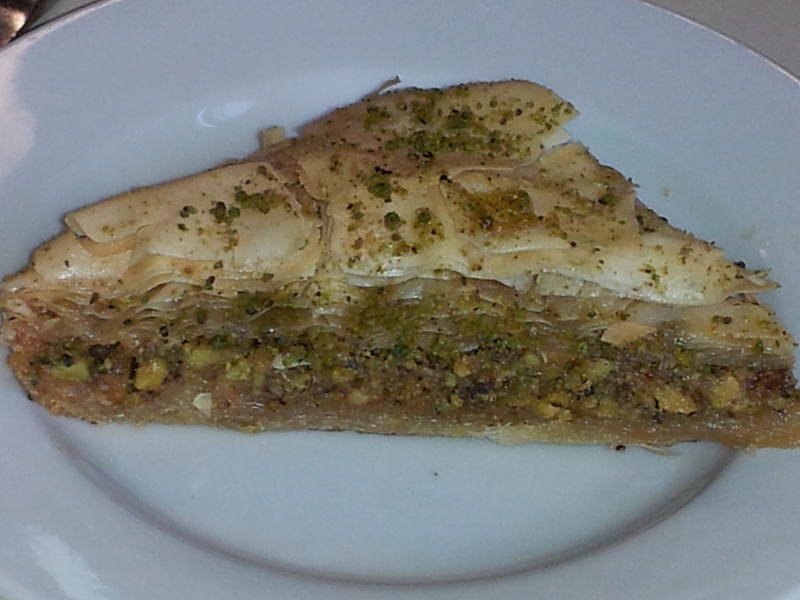 We finished with the baklava. 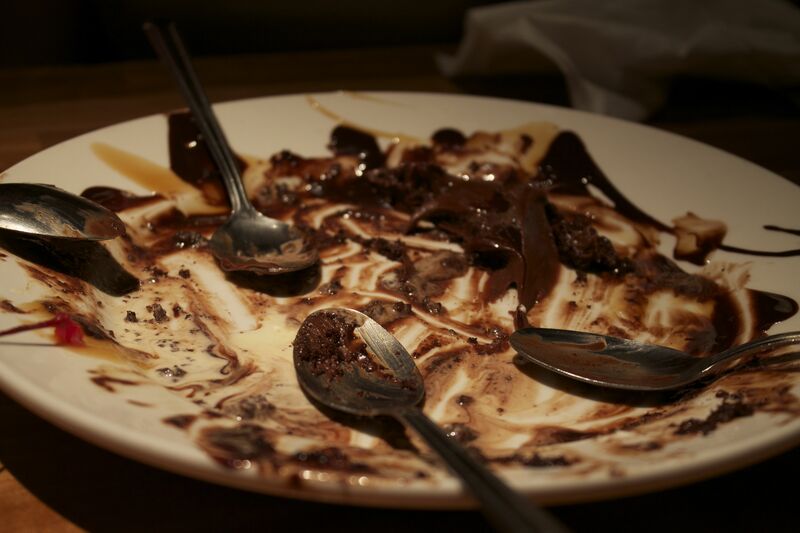 A very sweet way to end a rather enjoyable meal. They used pistachios and it was yummy. The service was excellent with a friendly waiter and manager. We were there late and he was quite attentive and even left us the pitcher of Lebanese iced tea (tea with orange blossoms, pink lemonade and pine nuts) because we enjoyed it so much we were draining our glasses. I’d definitely recommend this place and will probably stop by again myself.